There is extensive evidence of the benefits of a foot orthosis; however, it is dependent on the skill and experience of the clinician. The purpose of this study was to clarify the effects on 3D foot kinematics of a custom-made foot orthosis (CMFO) which reinforced the lateral longitudinal arch, without subjective assessments. All eighteen feet of nine normal volunteers who had a flat-foot deformity were included in this study. The CMFO was designed according to each participant’s foot shape using high-density polyethylene for the medial CMFO. The lateral part of the CMFO was then designed to cover the lateral longitudinal arch using polypropylene and was made to fit the medial CMFO. The full CMFO was defined as the medial CMFO together with the lateral CMFO. Eleven reflective skin markers were mounted over the anatomical landmarks of the foot and foot motion during the forward lunge without stride were recorded using eight infrared cameras; the spatial coordinates of those markers were then calculated. Differences between the three conditions: without CMFO, with medial CMFO and with full CMFO in displacement of all markers, were then calculated during the forward lunge. Medial movements of the third metatarsal base, and the medial and posterior top of the calcaneus with the full CMFO were significantly smaller than those with the medial CMFO. Therefore, the full CMFO which reinforced the lateral longitudinal arch could cause reduced movement of the rear-foot indicated by the calcaneus during the forward lunge. Our CMFOs demonstrate that changing the stiffness of the lateral part of the CMFO could reduce rear-foot motion in the medial direction without any form change. This might help with the manufacture of an appropriate CMFO without subjective assessment. The foot is made up of the seven tarsal bones, five metatarsals, and fourteen phalanges. The human foot has three arches: the medial longitudinal arch, the lateral longitudinal arch, and the transverse arch, and these play three important roles. The first is to buffer the impact force during the loading response. Second is maintenance of the stability and support of the lower limb, and third is assistance in forward propulsion during locomotion. Dysfunction of the three arches of the foot leads to excessive mechanical stress on the lower limbs. Flat-foot deformity, which is defined as decreased height of the medial longitudinal arch with excessive foot pronation, has been linked to various conditions including medial tibial stress syndrome [1-3], anterior knee pain syndrome , Achilles tendinopathy [5, 6], and plantar fasciitis [7, 8]. Foot orthoses (FOs) are frequently-prescribed interventions for flat-foot deformity [9-11]. FOs generally aim to realign skeletal structures, alter movement patterns of the lower extremity during gait and most importantly, reduce symptoms associated with lower limb conditions [11,12]. Custom-made foot orthoses (CMFOs) are widely known as one of the conservative treatments for overuse injuries . Several researchers have investigated the effects of CMFOs in producing positive clinical outcomes [14-17]. Previous studies have shown that CMFOs influence the biomechanics of the lower limb [10, 18-23]. In foot kinematics, many studies have shown that FOs which aim to support the medial longitudinal arch reduce the pronation of the foot [24, 25]. McLean, et al, reported that a 6-week intervention using semi-rigid CMFOs led to a significant decrease in maximum eversion angle and velocity of the rear-foot . Moreover, a significant decrease in the maximum ankle inversion moment and angular impulse during the loading phase and impact peak has been reported with the use of a semi-rigid CMFO . Kido, et al, assessed the effects of insoles which raised the medial longitudinal arch by 10 mm with an inner wedge for flat-foot deformity using subject-based three-dimensional (3D) computed tomography (CT) models . They reported that therapeutic insoles significantly suppressed the eversion of the talocalcaneal joint. CMFOs for flat-foot deformity cause increased activity of the tibialis anterior and decreased activity of the peroneus longus during the contact phase of gait and increased activity of the tibialis posterior and decreased activity of the peroneus longus during midstance and propulsion phase . A review by Landorf, et al, concluded that the CMFO is one of the effective interventions for heel pain . Many types of CMFO are aimed at supporting the medial longitudinal arch, although the foot arch consists of three arches. Kudo, et al, reported that it is important for the 3D foot kinematics of the foot in flat-foot deformity to be maintained, not only with regard to the medial longitudinal arch but also the lateral longitudinal arch . There is a great deal of evidence supporting the benefits of a foot orthosis; however, it is dependent on the skill and the experience of the clinicians, and it is unclear how the material and form used influence foot kinematics and lower limb kinetics. In the clinical setting, foot conditions during motion are assessed by motion observation which is not a quantitative assessment. Thus, the most important assessment used in the manufacture of foot orthoses lack an objective focus, and it is necessary to individually mold and paste the orthosis. Consequently there is a requirement to provide foot orthoses based on foot biomechanics without subjective assessments. The purpose of this study was to clarify the effects on 3D foot kinematics of CMFOs which reinforce the lateral longitudinal arch without subjective assessments. All eighteen feet of nine volunteers (age; 20.6 ± 0.7 years, height; 162.6 ± 8.1 cm, weight; 54.7 ± 6.9 kg, male/female; 2/7) with flat-foot deformity were included in this study. Subjects did not have any pain of the lower limb, nor any pain history. The flat-foot deformity was defined as a score of more than five points on the Foot Posture Index version six (FPI-6) . Ethical approval was obtained from the Morinomiya University of Medical Sciences and informed consent was obtained from all participants. The foot shape was modeled using a foot impression box at the bench setting. A plaster foot model was created based on the foot impression, and the CMFO molded from the plaster foot model using high density polyethylene for the medial part of the CMFO (Figure 1-a). The lateral part of the CMFO which covered the heel and cuboid was created using polypropylene (Figure 1-b) and was made according to the medial CMFO. The full CMFO was defined as the medial CMFO mounted on the lateral CMFO. Reflective skin markers were mounted over eleven anatomical landmarks which were the 1st, 2nd, and 5th metatarsal heads (MTH) and the 1st, 3rd, and 5th metatarsal bases (MTB), the navicular (NAV), the cuboid (CUB), and the medial, lateral and posterior top of the calcaneus (CALM, CALL, CALP). Foot motions during the forward lunge without stride were recorded using eight infrared cameras (VICON vero, VICON, Oxford, UK) at 100 Hz, and the spatial coordinates of the markers were calculated, while ground reaction forces were captured using two AMTI force plates at 1,000 Hz (BP600900, Advanced Mechanical Technology Inc., Watertown, MA, USA). Figure 1 Picture of the CMFO. a: Medial CMFO b:Lateral CMFO c: Medial view of the medial CMFO d: Lateral view of the medial CMFO. The CMFO according own plaster foot model using the high density polyethylene as the medial CMFO (a,c,d). And the lateral part of the CMFO which was covered on the heel and cuboid using the polypropylene were made according to the full CMFO (b). Figure 2 Forward range of motion. A: Starting position of the forward lunge involved standing upright with measurement foot stance one step forward. B: Whole plantar surface in contact with floor and the body weight was loaded on the forefoot. Vicon Nexus software was used to reconstruct the three-dimensional coordinates of each marker during motion. Cut-off frequency was 10 Hz using a Butterworth digital filter. The starting position of the forward lunge involved standing upright in a stance with the measurement foot one step forward (Figure 2). The entire plantar surface was maintained in contact with the floor and approximately 70–80 percent of the body weight was loaded on the forefoot. Subjects were instructed to complete the forward lunge within 1 second or less, and they were allowed enough time to practice. Five repetitions of the forward lunge were performed. Each marker was tracked from the starting position to the forefoot weight-loading position in which the lower leg was maximally-inclined forward and the displacement of each marker was calculated. The differences in the displacement of each marker among the three conditions of without CMFO, medial CMFO and full CMFO were analyzed using the Freedman test and the post-hoc Bonferroni test. Statistical analyses were performed using SPSS ver24 (IBM Corp., Armonk, NY, USA), and significance was set at P < 0.05. The three-dimensional movement of the markers is shown in Tables 1, 2, and 3. In the mediolateral direction (Table 1), all markers moved medially during the forward lunge, and almost all markers, with the exception of MTH5, showed a significant difference among the three conditions. Movements of the foot markers with the medial and full CMFO were smaller than those without the CMFO. Moreover, movements of MTB3, CALM, and CALP with the full CMFO were significantly smaller than those with the medial CMFO. 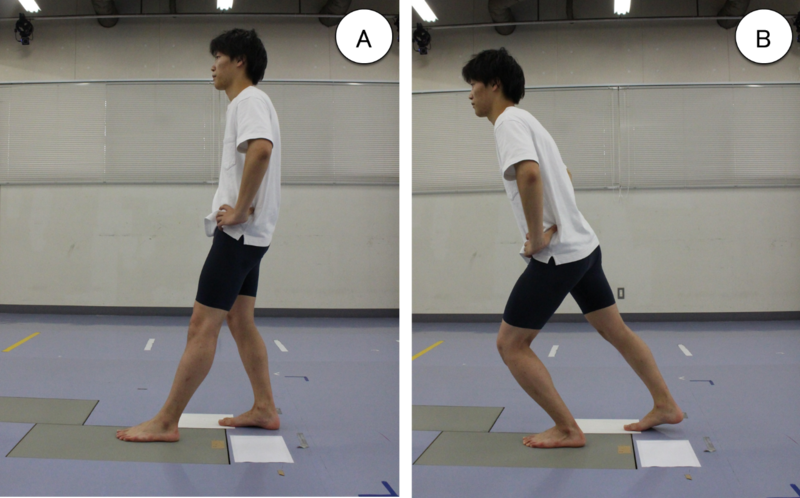 In the anteroposterior direction (Table 2), all markers moved forward during the forward lunge. Movements of the MTH2, MTB1, CUB, NAV, CALL and CALP markers were significantly different among the three conditions. Movements of the MTB1, CUB and NAV markers with the medial CMFO were significantly smaller than those without the CMFO, while the forward movement of the NAV with full CMFO was also smaller than that without the CMFO. The movements of the MTB1, CALL and CALM markers with the full CMFO were larger than those with the medial CMFO. In the vertical direction (Table 3), all markers except the CALP, which was elevated, were reduced during the forward lunge. Movements of most of the markers except the MTH5, MTB5 and CALL were significantly different among the three conditions. The movements of the MTH2, MTB3 and CUB with the full CMFO were significantly larger than those without the CMFO. Movements of the CALM and NAV with full CMFO were significantly smaller than those without the CMFO. Movements of the MTH1, MTH2, MTB3, MTB1 and CUB with the full CMFO were significantly larger than those with the medial CMFO. Table 1 The medial movement of the each makers [mm]. †:difference between without CMFO　††: difference between medial CMFO. Table 2 The forward movement of the each makers [mm]. †:difference between without CMFO　††: difference between medial CMFO. Table 3 The vertical movement of the each makers [mm]. †:difference between without CMFO　††: difference between medial CMFO. Medial movements of almost all markers with both forms of the CMFO were lower than those without the CMFO, and medial movements of the rear-foot indicated by the CALM and CALP markers with the full CMFO were smaller than those with the medial CMFO. Forward movements of the midfoot with the medial CMFO were significantly lower than those without the CMFO, and vertical movements of the medial foot markers MTH1, NAV and CALM were smaller than those without the CMFO. Moreover, vertical movement of the forefoot with the full CMFO were larger than those with the medial CMFO or without the CMFO. However, there were slight differences (approximately 1 mm) among the three conditions in the forward and vertical directions. This suggests that the full CMFO which reinforced the lateral longitudinal arch could cause reduced movement of the hindfoot indicated by the calcaneus during forward lunge. The lateral longitudinal arch of the foot is composed of the calcaneus, the cuboid and the fifth metatarsal. It is supported by both a static stabilizer in the form of the long plantar ligament and dynamic stabilizers of the peroneus longus, peroneus brevis and abductor digitorum minimi. Keystones of the lateral and the medial longitudinal arch are the cuboid and the navicular, respectively. The lateral longitudinal arch is stiffer than the medial longitudinal arch, and its movements are smaller. Thus, collapse of the lateral longitudinal arch is rare. However, Fukano and Fukabayashi demonstrated that angular changes of the lateral longitudinal arch are greater than those of the medial longitudinal arch during single leg landing . Noh, et al, reported that soccer players with medial tibial stress syndrome have an abnormal structural deformation with a larger decrease in both the medial and the lateral longitudinal arch . We previously reported that the foot kinematics of flat feet with a history of foot pain are important to forward movements of the cuboid . Therefore, we hypothesized that a CMFO which reinforced the lateral longitudinal arch would improve foot kinematics for flat-foot deformity. Both a full and a medial CMFO could reduce medial movements of the rear foot. Mechanical overloading in flat-foot deformity has been controversial, however there are some reports which describe abnormal rear-foot kinematics (e.g. excessive rear-foot eversion or increased range of rear-foot eversion), abnormal foot and ankle kinetics (e.g. elevated joint moments or abnormal loading forces) and altered physical function (e.g. altered muscle activation and timing or increased energy consumption) [33, 34]. Therefore, both the CMFOs we provided have the effects of controlling foot kinematics in flat-foot deformity. Mills, et al, investigated the biomechanical effects of three different types of orthoses (hard, medium and soft), and they showed that the least comfortable orthosis caused a greater increase in the control/support of the frontal plane for a mobile midfoot, while the opposite was true for a non-mobile foot . The frontal plane movements consisted of both medial and vertical movements. The medial CMFO decreased the vertical movements of the midfoot more than the full CMFO. Therefore, the medial CMFO is likely to be more uncomfortable than the full CMFO. However, the full CMFO could not decrease the forward movement of the cuboid, nor could it increase the medial movements of the MTB3. Cuboid movements in flat feet of the previous study showed larger forward movements and smaller medial and vertical movements than those of normal feet . This indicated that the foot motion of patients with flat feet was reduced in the frontal plane. Our CMFO could not induce controlled movement of the midfoot in the frontal or sagittal plane. The reason why our full CMFO could not control cuboid motion might be due to the form of the reinforcement part of the lateral longitudinal arch of the CMFO. It was necessary that the reinforced part of the lateral longitudinal arch was expanded in both distal and medial directions. However, the CMFOs we provide demonstrate that changing the hardness of the lateral part of the CMFO could reduce rear-foot motion in the medial direction without any change in form. This might help in the manufacture of CMFOs without subjective assessment such as motion observation. There are two limitations to this study. Firstly, we did not assess the kinematics during locomotion. There have been some studies which investigated the kinematic effects of a CMFO during shod walking. However, in these studies the researchers also manufactured the shoes, and the rigidity of the shoes also provided some support to the medial side of the foot, affecting the biomechanical effects of the CMFO. Therefore, we investigated the kinematics during the forward lunge. Future studies will investigate effects of the CMFO during locomotion. The second limitation is the definition of flat feet. In our previous study, flat feet were defined as those with more than five points of the FPI-6 values and having a history of pain in the foot and ankle which was related to the flat-foot deformity . However, in this study, none of the subjects had any history of foot pain. It is difficult to define normal feet, because normal feet without a collapsed medial longitudinal arch of the foot might be injured due to overuse syndrome, and there are many feet that did not have any pain, although the medial longitudinal arch of the foot had collapsed. Therefore, it is possible that some subjects diagnosed with flat feet in this study have normal function, although a lower medial longitudinal arch was observed. This work was supported by JSPS KAKENHI Grant Number JP15K16408. Japan Society for the Promotion of Science (JSPS); KAKENHI (Multi-year Fund); Grant-in-Aid for Young Scientists (B). Kudo S, Hatanaka Y. Forefoot flexibility and medial tibial stress syndrome. J Orthop Surg (Hong Kong). 2015 Dec;23(3):357-60. Bandholm T, Boysen L, Haugaard S, Zebis MK, Bencke J. Foot medial longitudinal-arch deformation during quiet standing and gait in subjects with medial tibial stress syndrome. J Foot Ankle Surg. 2008 Mar-Apr;47(2):89-95. Noh B, Masunari A, Akiyama K, Fukano M, Fukubayashi T, Miyakawa S. Structural deformation of longitudinal arches during running in soccer players with medial tibial stress syndrome. Eur J Sport Sci. 2015;15(2):173-81. Duffey MJ, Martin DF, Cannon DW, Craven T, Messier SP. Etiologic factors associated with anterior knee pain in distance runners. Med Sci Sports Exerc. 2000 Nov;32(11):1825-32. Lorimer AV, Hume PA. Achilles tendon injury risk factors associated with running. Sports Med. 2014 Oct;44(10):1459-72. McCrory JL, Martin DF, Lowery RB, Cannon DW, Curl WW, Read HM, Jr., et al. Etiologic factors associated with Achilles tendinitis in runners. Med Sci Sports Exerc. 1999 Oct;31(10):1374-81. Pohl MB, Hamill J, Davis IS. Biomechanical and anatomic factors associated with a history of plantar fasciitis in female runners. Clin J Sport Med. 2009 Sep;19(5):372-6. Wearing SC, Smeathers JE, Urry SR, Hennig EM, Hills AP. The pathomechanics of plantar fasciitis. Sports Med. 2006;36(7):585-611. Hume P, Hopkins W, Rome K, Maulder P, Coyle G, Nigg B. Effectiveness of foot orthoses for treatment and prevention of lower limb injuries : a review. Sports Med. 2008;38(9):759-79. Mundermann A, Nigg BM, Humble RN, Stefanyshyn DJ. Foot orthotics affect lower extremity kinematics and kinetics during running. Clin Biomech (Bristol, Avon). 2003 Mar;18(3):254-62. Collins N, Bisset L, McPoil T, Vicenzino B. Foot orthoses in lower limb overuse conditions: a systematic review and meta-analysis. Foot Ankle Int. 2007 Mar;28(3):396-412. McMillan A, Payne C. Effect of foot orthoses on lower extremity kinetics during running: a systematic literature review. J Foot Ankle Res. 2008 Nov 17;1(1):13. Root ML. Development of the functional orthosis. Clin Podiatr Med Surg. 1994 Apr;11(2):183-210. D’Ambrosia RD. Orthotic devices in running injuries. Clin Sports Med. 1985 Oct;4(4):611-8. Saxena A, Haddad J. The effect of foot orthoses on patellofemoral pain syndrome. J Am Podiatr Med Assoc. 2003 Jul-Aug;93(4):264-71. Vicenzino B, Collins N, Cleland J, McPoil T. A clinical prediction rule for identifying patients with patellofemoral pain who are likely to benefit from foot orthoses: a preliminary determination. Br J Sports Med. 2010 Sep;44(12):862-6. Bates BT, Osternig LR, Mason B, James LS. Foot orthotic devices to modify selected aspects of lower extremity mechanics. Am J Sports Med. 1979 Nov-Dec;7(6):338-42. Smith LS, Clarke TE, Hamill CL, Santopietro F. The effects of soft and semi-rigid orthoses upon rearfoot movement in running. J Am Podiatr Med Assoc. 1986 Apr;76(4):227-33. Novick A, Kelley DL. Position and Movement Changes of the Foot with Orthotic Intervention during the Loading Response of Gait. J Orthop Sports Phys Ther. 1990;11(7):301-12. Baitch SP, Blake RL, Fineagan PL, Senatore J. Biomechanical analysis of running with 25 degrees inverted orthotic devices. J Am Podiatr Med Assoc. 1991 Dec;81(12):647-52. Nawoczenski DA, Cook TM, Saltzman CL. The effect of foot orthotics on three-dimensional kinematics of the leg and rearfoot during running. J Orthop Sports Phys Ther. 1995 Jun;21(6):317-27. Williams DS, 3rd, McClay Davis I, Baitch SP. Effect of inverted orthoses on lower-extremity mechanics in runners. Med Sci Sports Exerc. 2003 Dec;35(12):2060-8. Branthwaite HR, Payton CJ, Chockalingam N. The effect of simple insoles on three-dimensional foot motion during normal walking. Clin Biomech (Bristol, Avon). 2004 Nov;19(9):972-7. Kim SH, Ahn SH, Jung GS, Kim JH, Cho YW. The effects of biomechanical foot orthoses on the gait patterns of patients with malalignment syndrome as determined by three dimensional gait analysis. J Phys Ther Sci. 2016 Apr;28(4):1188-93. MacLean CL, Davis IS, Hamill J. Short- and long-term influences of a custom foot orthotic intervention on lower extremity dynamics. Clin J Sport Med. 2008 Jul;18(4):338-43. Kido M, Ikoma K, Hara Y, Imai K, Maki M, Ikeda T, et al. Effect of therapeutic insoles on the medial longitudinal arch in patients with flatfoot deformity: a three-dimensional loading computed tomography study. Clin Biomech (Bristol, Avon). 2014 Dec;29(10):1095-8. Murley GS, Menz HB, Landorf KB. Foot posture influences the electromyographic activity of selected lower limb muscles during gait. J Foot Ankle Res. 2009 Nov 26;2:35. Landorf KB, Keenan AM. Efficacy of foot orthoses. What does the literature tell us? J Am Podiatr Med Assoc. 2000 Mar;90(3):149-58. Kudo S, Hatanaka Y. Comparison of the foot kinematics during weight bearing between normal feet and the flat feet. The Foot and Ankle Online Journal. 2016;9(1):2. Redmond AC, Crosbie J, Ouvrier RA. Development and validation of a novel rating system for scoring standing foot posture: the Foot Posture Index. Clin Biomech (Bristol, Avon). 2006 Jan;21(1):89-98. Fukano M, Fukubayashi T. Motion characteristics of the medial and lateral longitudinal arch during landing. Eur J Appl Physiol. 2009 Feb;105(3):387-92. Ross M. Use of the tissue stress model as a paradigm for developing an examination and management plan for a patient with plantar fasciitis. J Am Podiatr Med Assoc. 2002 Oct;92(9):499-506. Dananberg HJ. Sagittal plane biomechanics. American Diabetes Association. J Am Podiatr Med Assoc. 2000 Jan;90(1):47-50. Mills K, Blanch P, Vicenzino B. Comfort and midfoot mobility rather than orthosis hardness or contouring influence their immediate effects on lower limb function in patients with anterior knee pain. Clin Biomech (Bristol, Avon). 2012 Feb;27(2):202-8.